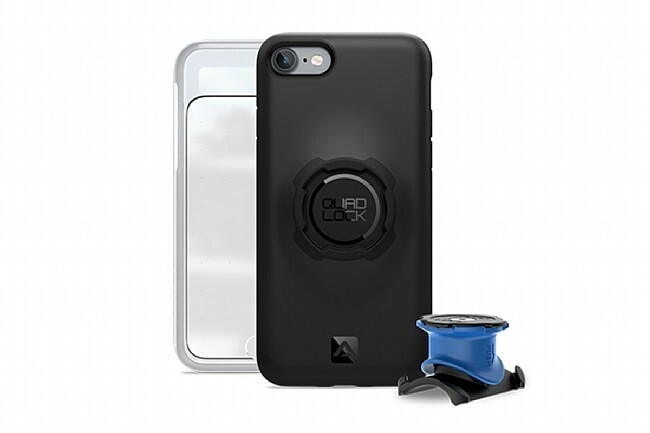 Quad Lock produces some of the strongest and most streamlined smartphone mounts on the market. Their iPhone 7 Bike Mount Kit makes using an iPhone to navigate, track fitness, or view notifications while riding a simple and secure process. Included is Quad Lock’s Bike Mount Pro that attaches to stems and handlebars with removable O-rings or a more permanent zip tie attachment. The slim and robust phone case perfectly fits Apple’s iPhone 7 and has the compact Quad Lock mounting mechanism built in on the back. Just set the phone at a 45° angle and twist to secure it in either portrait or landscape orientations.